Join us for our decadent brunch, Saturdays & Sundays, for a special treat: 1/2 OFF all CHAMPAGNE! 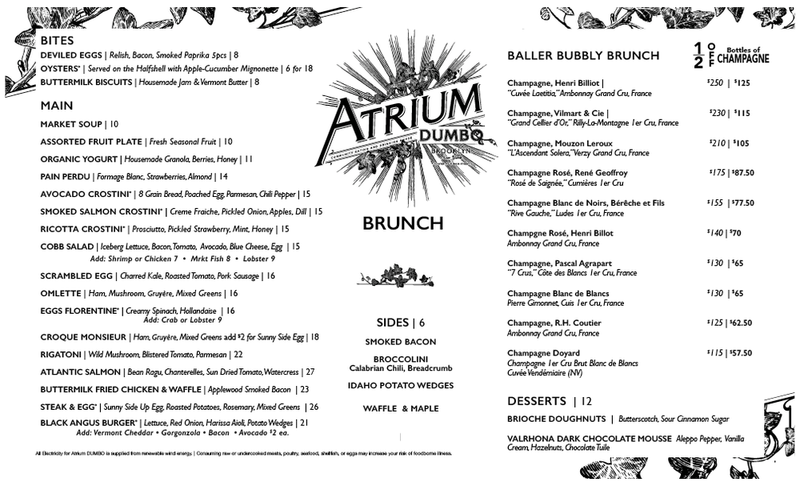 Because what goes better with the weekend than some baller bubbles AND brunch? We are open for Brunch every Saturday & Sunday from 11am-3:30pm. Join us for belgian waffles, buttermilk fried chicken and poached eggs coupled with personal favorite Champagnes that are hand picked by our Master Sommelier partner Alexander LaPratt MS.
Atrium is an eating and drinking house focused on supporting our community and partnering with our neighbors to offer local, fresh and seasonal fare coupled with a boutique selection of wines, local craft beers and seasonal savory cocktails. Sign up to receive news about upcoming food and wine events at Atrium DUMBO!